Anyone who knows me knows that I LOVE working at the Food Bank. I love my job and I really love the mission. Food is a big deal! I grew up with food being the center of most celebrations and nearly all of our conversations. I certainly cannot say that this has changed much as I have gotten older. Food is still very central to our lives, at home and at work. We talk constantly about what we like, what we don’t, what is good for us, what is not. I think a lot about the families that we help every day and how difficult it must be to have to choose between things like health care and food. I don’t think food should be a luxury that only some families have access to. All families should have access to nutritious food. You hear it every day. A nutritious diet is so important for your health. We focus on this at the Food Bank and that is why more than 40% of the food distributed each year is fresh produce. I was so excited to hear that the Food Bank of Northern Nevada was awarded a grant that would allow us to operate the Prescription Pantry program, a new pilot where medical professionals are screening patients to see if they have access to the food they need and if not, writing them prescriptions for the healthy food that matches their diagnosis. Brilliant! The part that really is exciting to me is bringing the medical community into the conversation, and the solution. They are the ones that can really tell us if access to healthy food is making a difference in the health of their patients. If access to a nutritious diet can save money on hospital stays, prescriptions, and Dr. visits, we could be really onto something. We might even want to make access to healthy food a priority for families living in poverty. What a concept! We are off and running. It is a true collaboration and the process of getting everyone working toward the same goal is extensive, but so worth it. Patients are receiving foods that they need to help manage their diagnosis whether it is diabetes or heart disease and more than 9,000 people have received food through this program to date. Stay tuned because I think some exciting news could be coming out of this pilot program and we are thrilled to be a part of it. 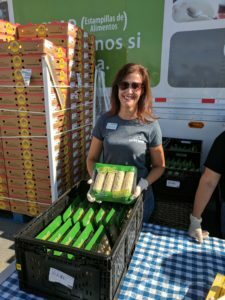 The Food Bank of Northern Nevada has joined community non-profit organizations and health providers to provide an exciting new program that connects low income patients to nutritious food. Through the Prescription Pantry program, patients who face food insecurity are connected with the food they need to help with diagnoses such as heart disease and diabetes. Health providers included in the program include Renown Health, Community Health Alliance, and Northern Nevada HOPES. Food prescriptions are also being offered through Care Chest of Sierra Nevada. Patients are able to present their prescriptions at St. Michael’s Catholic Church, Sparks Seventh Day Adventist Church, The Community Food Pantry, Destiny Christian Center, the Community Health Alliance Food Pantry (for CHA patients), St. Francis of Assisi Food Pantry and Rehoboth Holy Temple. Urban Roots, a local education non-profit, is also growing food to be distributed through the program while teaching local students about health and food insecurity in their community. Jocelyn Lantrip is the Director of Marketing & Communications for the Food Bank of Northern Nevada and has worked for the organization for nine years. She loves her job as a hunger fighter and is very passionate about families getting the food they need. She also loves to talk about the Food Bank and give tours of the warehouse facility. Contact her anytime with questions. Congratulations, FBNN! This is great news! This is something on Three Square’s list of things to do also. Would I be able to talk more with anyone from FBNN about how you made this happen? Absolutely, Regis! You can contact Jenny Yeager, our Director of Programs & Community Engagement, and she will be happy to share some of the background with you. This is an excellent program, transformational for under-resourced recipients. After presenting the Bridges to Health and Healthcare training to the Nevada Health Centers team in Las Vegas, they are very interested in developing this.